Every year the Cancer Council encourages people to host morning teas across Australia to support Cancer research with Australia's Biggest Morning Tea. This year to date they have raised over $530,000 for the cause. Cancer has affected all of our lives in some way and to continue to advance in medical research and help those who have to fight the battle of cancer Costume Box decided to host a Alice in Wonderland Mad Hatters Costume Tea Party. It was an early start to get all the decorations up and make the room where we were having our tea party look busy, colourful and MAD. All the staff came dressed in their favourite Alice in wonderland inspired costumes or hats. To create the Tea Party atmosphere we used colourful crepe paper, balloons supplied by the Cancer Council, cardboard cake stands, playing cards, pictures off the internet that we glued onto a red plastic table cloth, cups and saucers, hookah, and lots of colourful treats and table wear. The Goodies! The staff were busy bakers! CEO's Roma & Nikki having a cuppa! Some of the treats for sale were cupcakes, mars bar slice, chocolate crackles, sandwiches, brownies, banana bread, scones, fruit juice, lolly boxes, fresh exotic fruit, potato salad cups just to mention some. We sold each item for a gold coin donation and with a target of $300. 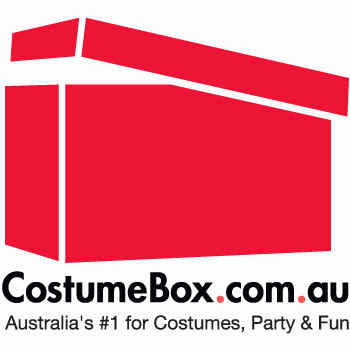 Costumebox.com.au ended up raising $371.00 to support Cancer research. We are all very proud and encourage everyone to join in such a great cause.